Heading out into The Great Outdoors soon? If you are, and you are a coffee fan (we refuse to use the term 'addict', but y'know...), you'll probably find yourself frustrated by the lack of Starbucks in the woods. Sure, you could take your favourite coffee brewing apparatus with you, but again you might be left saddened by so few power sockets and by just how delicate your cafetière is. You need something a little more rugged and compact to brew yourself up a cup... you need the Bobble Presse. The what? The Bobble Presse is an all-in-one brewing system, similar to a cafetière (of French Press, if you're American) but neatly designed to be the same size as a hand-held mug and made from tough stainless steel. Now, when we were sent this to test, the plan was to hold on to it until our next camping feature (a couple are on the way this summer, BTW, like last year's), but instead we decided to review It now for one very important reason: cold brew. For those that don't know, cold brew coffee are regular coffee grounds that have been brewed over a long period (at least a day) in cold water. The increased length of the brew, coupled with the fact that the coffee can't be 'burnt' by hot water, makes cold brew coffee absolutely delicious and perfect for a warm day in the garden. Add milk, flavourings, spirits, ice... you name it, cold brew coffee is awesome. And the Bobble Presse is brilliant at making it. Why? Because it is the perfect size and construction for a daily cup of cold brew. The night before simply add your coffee grounds to the cup, pour in cold, ideally filtered, water, then stir the crap out of it. Pop on the silicone lid (which features air holes – crucial for cold brewing) and pop it in the fridge for the next morning. Then its a case of whipping off the top hours later, grabbing the included steel plunger (with metal, easy-clean, filter) and 'taking the plunge'. The great thing here is that the plunger has a rubber seal at the base, so once pressed the coffee grounds are trapped at the bottom and kept away from the actual liquid. If you were brewing a hot coffee you'd be doing the exactly the same thing, but over a few minutes with hot water, not hours with cold. Then you pop the top back on, open the leak-proof sipping spout, and drink away, you caffeine fiend!. 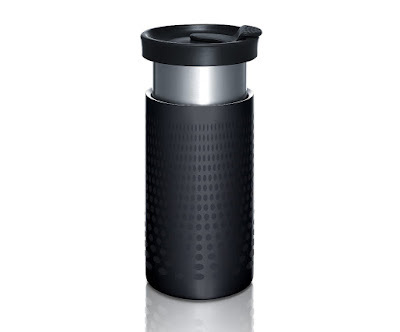 The Bobble Presse has a double wall to keep your beverage the temperature it should be for hours – an amount of time further increased once the plunger is inserted, adding an extra metal wall. For campers and trekkers this means that there is no mess at all, and even after you've drank the coffee, you can store the whole thing in your pack without fear that the spent grounds will leak and slime all over your stuff. For home-bods it is equally useful as it is the perfect size for a morning brew, and thanks to the cap it can be taken with you on the morning commute. A great innovation, and one coffee drinkers of all kinds should definitely try.